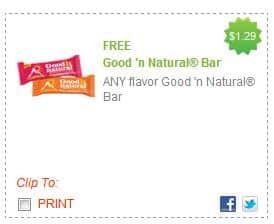 Click here to visit the Redplum site and you’ll be able to print a coupon good for a free Good n Natural Bar. If needed use the zip code 55555 and click the Grocery category. *Just a heads up though, some stores don’t accept internet coupons for free products.